Melody and lyrics play a key part in: (1) differentiating your song, (2) communicating your message, and (3) creating a compelling, memorable moment for a listener. So how can you achieve all three each time your write? Pat Pattison takes a look at a song by Ann Rapetti (with a live performance) and talks about melody and the lyric. 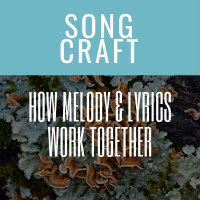 As she plays through the song, there’s discussion around placing emphasis on key words throughout the melody, and how word choice drives at least part of the options you have for creating unique sounding melodies.